Many contractors in the tristate region say that two factors will largely determine the industry’s robustness in the year to come—the economy and the upcoming general election. They reason that until the economy gains momentum, owners and developers will not shake their wait-and-see attitudes; and, until the next Congress is elected, federal funding levels for agencies and programs will remain a mystery with many projects left in limbo. Even so, contractors in the tristate region say they expect next year to be similar to 2011 and 2012 in that work will be available, but the volume of projects will not likely match pre-recession levels, and competition for jobs will remain fierce. The majority of the 50 largest contractors that responded to ENR New York’s survey this year kept busy in 2011, posting year-over-year revenue growth in the region (see p. 27). Total 2011 regional revenue for the 50 firms climbed to $10.7 billion, up 15% compared with the prior year. Regional revenue at each of the top four firms in the ranking far exceeded the $1-billion mark. Top-ranked Turner Construction reached nearly $2.3 billion, up 19% from 2010. Like the majority of firms in the ranking, Turner’s largest project to break ground last year was in the transportation sector. Turner and joint venture partners Peter Scalamandre & Sons Inc., Freeport, N.Y., and Lend Lease (No. 6), are working on Delta Airline’s $1.2-billion Terminal 4 extension at John F. Kennedy Airport, which is set for completion next May (ENR New York 3/12 p. 16). Mergers and acquisitions also continued to play a role at some firms, including Tutor Perini (No. 3), whose acquisitions last year included the subcontracting firm GreenStar Services (ENR New York 9/12/11 p. 54). Tutor Perini has scored some big projects as well, including work on the plaza substation in Queens for the East Side Access project, its largest to break ground last year, as well as the $510-million Resorts World hotel and casino, also in Queens. Major projects like these helped propel the contractor’s 2011 revenue to nearly $1.7 billion, from about $483 million in the prior year. The firm appears set for further growth as earlier this year it was named contractor for the $4-billion Hudson Yards development project in Manhattan. Sector-by-sector, civil/transportation work will continue “to look pretty good” this year and next, says Mike McNally, president and CEO, Skanska USA (No. 2). However, infrastructure work will significantly decline in 2014 if a long-term federal transportation bill is not in place, he says. To make an impact, the bill would need to allow for a $50-billion-per-year spending package, he says. Skanska USA’s regional revenue, which includes both Skanska USA Building and Skanska USA Civil, totaled $1.7 billion in 2011, driven mainly by work in its civil branch, McNally says. This includes the $2.1-billion No. 7 subway line extension project in Manhattan. A joint venture of Skanska USA and Railworks, New York, is working on the project, which is expected to be completed by June 2014. Skanksa USA is also working on the 2-billion-gallon-per-day Catskill/Delaware Ultraviolet Disinfection Facility, the world’s largest, under way at Mt. Pleasant-Greenburgh, N.Y. Skanska is part of the project’s GC joint venture team with Ecco III Enterprises Inc., Yonkers, N.Y., and J.F. White Contracting Co., Framingham, Mass. The tristate region has two and a half years’ worth of civil work backlog, McNally says. This includes planned projects on the Goethals, Tappan Zee, Verrazano Narrows and Bayonne bridges. “Investments in infrastructure work will create opportunities for development in the city, such as new office, retail and apartment buildings,” says Ralph Esposito, principal in charge at Lend Lease’s New York office. Work on the bridges as well as work at LaGuardia, John F. Kennedy and Newark airports are significantly contributing to growth, he adds. However, after 2013, infrastructure work “doesn’t look good because MTA and other agency budgets are being cut,” McNally says. That is borne out by recently published New York Building Congress data showing that New York City construction employment tumbled 32% in the heavy construction and civil engineering sector in the first quarter compared with the year-ago period. The group did not provide total employment figures for this sector, but overall industry employment in the city during this time reached 102,600, down 3% from the same prior-year period. NYBC analysis also shows that the city’s capital investment during the Bloomberg administration peaked in 2010 with spending at $10.5 billion and remained strong last year at $9.5 billion. The city is on target in the current 2012 fiscal year, which ends June 30, to spend $9.1 billion, NYBC says. However, spending cutbacks are projected in 2013 through at least 2016. “Once the World Trade Center work is completed, and if Hudson Yards doesn’t start as planned, there is definitely going to be a slippage in construction spending in New York,” Esposito says. Nevertheless, this has not been a slow year for industry, says Bob Mullen, CEO at Structure Tone (No. 4), which reported a 6.5% rise in regional revenue to $1.4 billion. Mullen expects his firm’s regional revenue to jump 15% by year-end, driven largely by work in higher education, health care and life sciences, hotel renovations and building repositioning. The firm’s work includes CM-at-risk for the repositioning of an eight-story building at 330 Hudson St. into a 17-story structure. In the private sector, “if you had good success in selling work in 2011, you probably have a pretty healthy backlog,” he says. Many of the top 50 reported that their largest projects to break ground last year were in the education sector. Higher education is one of the markets set for strong growth, as many universities in the region have major long-term expansion plans, Mullen says. These include sizable projects at Columbia, Cornell, Fordham, New York, Princeton, Rutgers, William Paterson and Yale universities, as well as the University of Medicine & Dentistry of New Jersey, New Brunswick, and the Weill Cornell Medical College, New York. “There’s a lot coming, but a lot of that is taking time in getting to the starting gate,” he says. The health care sector is also awash in projects, providing work for such firms as Lend Lease, which is CM for the $316-million Mount Sinai Center for Science and Medicine project in New York. Some of the region’s major projects valued at $200 million or more are planned or under way at institutions including Albany Medical Center; Goldwater North Memorial Hospital, New York; St. Michael’s Medical Center, Newark, N.J.; Stamford Hospital; the University of Connecticut Health Center, Farmington; SUNY Downstate Medical Center, Brooklyn. 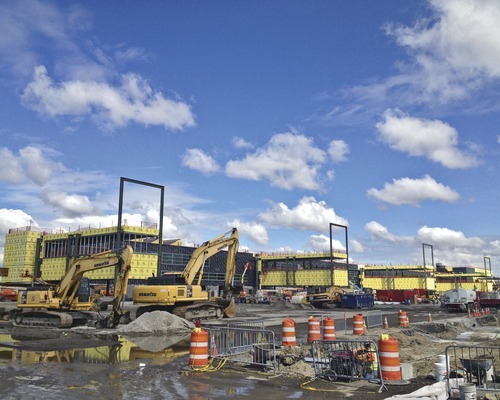 ; Waterbury Hospital in Connecticut; and Women and Children’s Hospital of Buffalo, N.Y.
Another sector on the rise is residential, which is Lend Lease’s largest and most profitable market, Esposito says. The firm is CM for One57, a 1,000-ft, 882,141-sq-ft mixed-use tower in Manhattan. The new building, scheduled for completion next year, will consist of 356,467 sq ft of hotel, parking and retail space and 525,675 sq ft of residential space. New York’s residential sector showed some “surprising” growth last year, Anderson says. He is optimistic that it as well as the institutional sector will continue to improve and that the economy, whenever it rebounds, will do so strongly. (AP) – U.S. builders increased their spending on construction projects for a second month in April. A pickup in home construction and commercial projects offset a fifth consecutive decline in government spending. 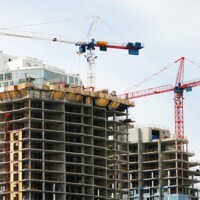 Construction spending rose 0.3% in April, matching an upwardly revised 0.3% March gain, according to data released Friday by the Commerce Department. The consecutive gains pushed spending to a seasonally adjusted annual rate of $820.7 billion to March. That is 7.6% above a 12-year low hit in March 2011. Still, the level of spending is roughly half of what economists consider to be healthy. Residential construction rose 2.8% in April, the best showing in six months, to an annual rate of $256.1 billion. Recent data shows that housing has stabilized after years of weakness following the collapse of the housing boom. Sales of new homes rose 3.3% in April to a seasonally adjusted annual rate of 343,000 units, the second highest level in two years. But the sales rate is still just half of the level that economists consider a healthy sales market. Builders have grown more confident since last fall, in part because more people are expressing interest in buying a home. In May, builder optimism rose to the highest level in five years, according to a monthly index compiled by the builders’ group. The economy grew at an annual rate of 1.9% in the first quarter. Residential construction added to growth. Economists expect the economy is growing between 2% and 2.5% in the current April-June quarter. They predict roughly the same growth for the rest of the year. Many analysts forecast that home construction will add to overall growth this year, the first time that has happened in five years. But the contribution is expected to be modest. One World Trade Center, the so-called Freedom Tower currently under construction in Lower Manhattan, technically became New York City’s tallest building on Monday, as workers erected steel columns on the 100th floor, 1,271 feet above the street, to make it stand 21 feet higher than the Empire State Building’s observation deck. 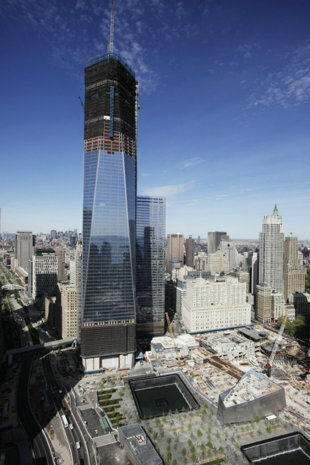 The Freedom Tower, which is being built to replace the twin towers that fell during the 9/11 terror attacks, won’t be completed until 2014. When it is, it will be 104 stories and likely declared the tallest building in America—surpassing Chicago’s 1,451-foot Willis Tower at 1,776 feet. The world’s (undisputed) tallest building is Burj Khalifa in Dubai, which stands at 2,717 feet. The New York City skyline is—once again—stretching to new heights. The latest progress at the World Trade Center is a testament to New Yorkers’ strength and resolve—and to our belief in a city that is always reaching upward. This building has been a labor of love for many, and I congratulate the men and women who have worked together to solve the challenges presented by this incredibly complex project. Today our city has a new tallest building—and a new sense of how bright our future is. The world’s most famous office building, the ancestor of all super-tall towers, welcomes our newer, taller cousin to the skyline. We’ve watched you grow, and now we salute you. (Bloomberg) – Potential homebuyers and sellers are growing more confident that the U.S. real estate market will begin to recover as soon as next year, according to a Prudential Real Estate survey. Some 60% of people surveyed last month had positive views about the housing market and 70% expected property values to improve over the next two years, according to the survey released Tuesday. About 63% of respondents said they considered real estate a good investment, up from 52% last year, the Irvine, Calif.-based broker reported. This is the second consecutive year consumer confidence in housing has improved, signaling the property market may “finally be climbing out of its deep hole,” said Stephen Van Anden, chief marketing officer for Prudential Real Estate. While foreclosures and declining home prices have contributed to a six-year real estate slump, rising employment and low mortgage rates may be bolstering buyer confidence. The Federal Reserve, in its regional Beige Book business survey issued Feb. 29, said the housing market “has improved somewhat in most districts” with Boston, Cleveland, Atlanta and Dallas among cities reporting increases in home sales. More than 90% of respondents in the Prudential survey said the housing crisis is a reminder they must be more cautious in buying and selling property. About 80% of people polled said homeownership is important to them, while 15% said the economic downturn made owning a home less important. “There is still a desire for homeownership, and as we see continued improvement in the job market, there is going to be an unleashing of pent-up demand,” Mr. Van Anden said. Survey respondents were 25 to 64 years old with a household income of at least $50,000, and either recently bought or sold a home or are considering a purchase or sale. Prudential Real Estate collected responses from 1,251 people. Feverishly working to wrap up two deals during Thanksgiving weekend, developer Joseph Sitt barely had time to sit down for dinner with his family. But by the following Tuesday, Thor Equities’ chief executive had much to be grateful for. That day he signed contracts to buy two Manhattan development sites, one on Fifth Avenue and West 43rd Street, and the other on Washington Street in the meatpacking district. Clearly, others share Mr. Sitt’s sentiments. Sales of development sites in Manhattan below Harlem have skyrocketed during the past two years. The rise comes amid growing optimism about long-term prospects for the city’s economy, its booming tourism industry, its strengthening residential markets and an increasing willingness among lenders to loosen their purse strings. The number of sites over 10,000 square feet sold in Manhattan quintupled from a post-crash low point in 2009 to 51 last year, according to Massey Knakal Realty Services. Meanwhile, sales in the city—excluding Staten Island—more than doubled, to 142, over the same period, while the average price per square foot surged 38%, to $173.22. Yet beneath that broad rise, the market remains very spotty. In Manhattan, for example, the total number of sales is still far below the 75 to 80 in a typical year, while the average price slipped 17%, to $311.22 a square foot, over the past two years. Massey Knakal Chairman Robert Knakal said that average was likely depressed by a number of sales of smaller and less desirable locations. In contrast, in prime neighborhoods such as Chelsea and the meatpacking district, prices are almost back to their boom levels. For example, a site on West 24th Street between Ninth and 10th avenues recently sold for nearly $360 per square foot. At the peak of the market in 2007, an identically sized site five blocks away fetched $380 a square foot. “We are seeing some really high prices being paid,” said Mr. Knakal. Whether that can continue will hinge on further improvements in the city’s economy. In recent months, job growth has been lackluster and is no longer running ahead of the national average. Meanwhile, New York’s traditional engine—the financial services industry—continues to shed employees. In the second half of last year, that combination, along with fears of a European meltdown, hit the recovery in the commercial leasing market hard. Leasing volumes sank 31% in the last two quarters compared with the previous two. The recent crop of buyers that has emerged recently, however, is generally more experienced and less leveraged, and looks to be far better equipped to weather such problems. “Now you have to have a track record and put in 40% to 50% in equity to qualify for a loan,” said Peter Hauspurg, chairman of Eastern Consolidated. Ironically, one of the factors helping to boost sales is an increasing number of distressed properties, victims of the last boom and bust, coming onto the market—many of them at bargain prices. That increased flow of troubled sites comes as banks are eager to shed some of their failed deals. Barclays Capital, for example, sold a lot at 360 10th Ave. to Sherwood Equities last year for $43.5 million after the borrower failed to pay back the loan. Sherwood, which paid cash, completed the deal in just eight days, paying about $145 a buildable square foot for the site between West 30th and West 31st streets, across from the High Line. The price was at least 19% below what the former owner paid when he was assembling the site between 2005 and 2007, public records show. Other developers, including Mr. Sitt, are wasting no time at all. He has already hired architect Morris Adjmi to design a seven-story property with a twisted steel façade for the Washington Street site. The developer plans to have retail shops in the base of the building and either an upscale office or hotel on the upper floors. “We’ll design with the utmost flexibility,” Mr. Sitt said, noting that he believes either option will be a success because creative companies crave office space in the meatpacking district, while retailers are keen on the area’s flood of tourists. Sky-high pedestrian traffic is also a key selling point of the space he is preparing to build on the Fifth Avenue lot he bought for $132 million, or $440 a buildable square foot, a price he considers a bargain. “When was the last time there was a development site for sale on Fifth Avenue?” he asks. The risk is that bargains tend to draw crowds, and that could yet slow things down a bit as prices inevitably rise in the face of increased demand. “There is a lot of equity out there chasing deals,” said Douglas Steiner, a developer whose family owns the Steiner Studios in the Brooklyn Navy Yard, and who late last year snapped up a site in downtown Brooklyn on Flatbush Avenue for $30 million. He plans to construct a 52-story rental building on the lot. But while he is still interested in buying more sites, he notes that there is more competition now that banks are more willing to lend again. (Bloomberg) – Confidence among U.S. homebuilders climbed more than anticipated in February to the highest level since May 2007, pointing to an improving outlook for construction. The National Association of Home Builders/Wells Fargo index of builder confidence rose for a fifth straight month, to 29 in February from 25 in January, figures from the Washington-based group showed Wednesday. The median forecast of economists surveyed by Bloomberg News called for a rise to 26. Readings below 50 mean more respondents said conditions were poor. D.R. Horton Inc. is among builders reporting a pickup in demand as borrowing costs hover near a record low and hiring accelerates. Efforts by the Obama administration and the Federal Reserve to shore up the real estate market and help distressed homeowners may limit the supply of foreclosed houses, lifting prospects for the industry. “The housing market is moving toward more sustainable growth,” Barry Rutenberg, chairman of the National Association of Home Builders and a builder from Gainesville, Fla., said in a statement. At the same time, the housing sector remains fragile, he said. The last time the builder confidence index increased five straight months or more was April through October 1995. February estimates of 51 economists in the Bloomberg survey ranged from 23 to 28. The gauge, which was first published in January 1985, averaged 54 in the five years leading to the recession in December 2007. It reached a record low of 8 in January 2009. The builders group’s index of current single-family home sales rose to 30 this month, the highest since May 2007, from 25 in the prior month, Wednesday’s report showed. A measure of sales expectations for the next six months advanced to 34, the best reading since July 2007, from 29. The gauge of buyer traffic rose to 22, the highest since June 2007, from 21. The confidence survey asks builders to characterize current sales as “good,” “fair” or “poor” and to gauge prospective buyers’ traffic. It also asks participants to gauge the outlook for the next six months. Builders in the West led the increase, with the index jumping to 44, the highest since July 2006, from 21. Confidence rose to 30 in the Midwest, the highest since April 2006. Sentiment decreased in the Northeast and South. D.R. Horton, the largest U.S. homebuilder by volume, reported net home orders rose to 3,794 in final three months of 2011, from 3,363 a year earlier. “Simply put, our business feels more positive,” Donald Tomnitz, CEO of the Fort Worth, Texas-based company, said in a Jan. 27 conference call. At the same time, “macroeconomic and housing conditions remain soft,” and “we are cautiously optimistic for the remainder for 2012,” he said. Bank of America Corp., J.P. Morgan Chase & Co. and three other U.S. banks reached a $25 billion settlement with 49 states and the U.S. government to end a probe of abusive foreclosure practices prompted by the collapse of the housing price bubble. President Barack Obama said the agreement, announced on Feb. 9, is a “major step” in reviving the housing market. Housing starts also are improving. Builders broke ground on new homes at a 675,000 annual pace in January, up from a 657,000 rate the previous month, according to the Bloomberg survey median ahead of a Commerce Department report due Thursday. Work on apartment projects has climbed as the foreclosure crisis turned more Americans into renters, helping to reenergize the industry that’s struggled since triggering the last recession. Construction of multifamily units will lead homebuilding again this year, allowing housing to contribute to growth for the first time in seven years, according to forecasts from economists Michelle Meyer of Bank of America and Celia Chen of Moody’s Analytics Inc.
(Bloomberg) – Construction spending in the U.S. rose in December at the fastest pace in four months, reflecting broad-based gains that signal the industry is stabilizing. Building outlays increased 1.5%, the biggest gain since August, Commerce Department figures showed Wednesday in Washington. The median estimate of 51 economists in a Bloomberg survey called for a 0.5% rise. A housing market that is gaining some steam as builders begin apartment projects may breathe life into the industry that’s struggled since triggering the recession in 2007. At the same time, decreased spending by the government may temper progress in construction as a whole. Estimates in the Bloomberg survey ranged from a drop of 0.6% to an increase of 1.5%. The Commerce Department revised the November reading down to a 0.4% gain from a previously estimated increase of 1.2%. A report Wednesday from ADP Employer Services showed companies added 170,000 workers to payrolls in January, reflecting job gains in services and at small businesses. The increase followed a 292,000 gain the prior month. Construction outlays were down 2% in December from the same time in 2010, before adjusting for seasonal variations. Private construction spending rose 2.1% in December from the prior month, the biggest gain since May. The increase brought the value up to $529.7 billion at an annual rate, the highest level since December 2009. Homebuilding outlays increased 0.8%, including a 0.2% increase in home improvement. Non-residential building climbed 3.3%. Spending on public construction advanced 0.5%, the report said. Federal construction spending increased 0.3%. The homebuilding industry is trying to recover from record- low traffic last year. About 302,000 new homes were sold in the U.S. in 2011, the worst year in data dating to 1963, Commerce Department figures showed Jan. 26. Housing starts fared better, growing by 3.4% last year to the highest level since 2008. The strength came from work on multifamily dwellings, which jumped as more Americans opted to rent rather than own. Conversely, single-family home construction in 2011 was the weakest in records going back to 1959. The market may be beginning to stabilize. Builders broke ground on 470,000 single-family houses at an annual rate in December, the most since April 2010, the Commerce Department said Jan. 19. Residential construction added 0.23 percentage points to gross domestic product in the fourth quarter, the largest contribution since the April-June period of 2010. Home sales and construction will improve in 2012, adding “modestly” to economic growth, according to a Fannie Mae forecast last month. Sales of new and existing homes are likely to increase 3.5%, and housing starts are projected to rise 16%, the group’s chief economist said Jan. 13. Homebuilder sentiment has also ticked up. The National Association of Home Builders/Wells Fargo sentiment index rose in January to the highest level since June 2007 as sales and buyer traffic improved. The largest U.S homebuilder by volume reported net home orders that rose to 3,794 in final three months of 2011 from 3,363 a year earlier. The Federal Reserve announced on Wednesday that it will not increase its benchmark interest rate until at least late 2014, saying that record-low rates are still needed to help boots the still sluggish economy. After a two-day meeting of the Federal Open Market Committee, the central bank said the economy is growing moderately, despite slowing global growth. The Fed described inflation as “subdued” — a more encouraging description than offered last month. A better outlook for prices will allow the Fed more room to keep rates low. Treasury yields fell on the news, while stocks quickly recovered their morning losses. Lower yields could further help reduce mortgage rates, which are tied to Treasuries, as well as boost stock prices as investors shift out of lower-yield government bonds. Economists believe the extended time frame for low rates could lead to further Fed action to try to stimulate the economy, but today the Fed held off on any further bond-buying programs to fuel growth. Other than pledging to keep its key rate at a record low well beyond the earlier mid-2013 target, the central bank’s statement today closely tracked its previous comments about economic conditions, using the same language to describe Europe’s debt problems and their impact on the global economy. U.S. companies are hiring, the stock market is rising, the housing market is improving, factories are busy and more people are buying cars, but the threat of a recession in Europe will likely continue to drag on the global economy, the United States included. The Fed said it would continue a program to further drive down long-term rates by selling shorter-term securities and buying longer-term bonds, but officials have resisted further bond buying for fear it would raise the risk of high inflation later. In two rounds of bond buying, the Fed purchased $2 trillion in government bonds and mortgage-backed securities to try to cut long-term rates and ease borrowing costs so as to encourage consumers and businesses to borrow and spend more. Lower yields on bonds also encourage investors to shift money into stocks. 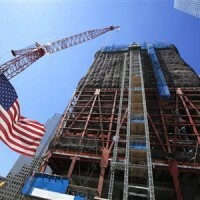 Construction spending in the U.S. rose in November for a third time in four months, indicating the industry helped boost growth at the end of 2011. Building outlays increased (CNSTTMOM) 1.2 percent, exceeding the median estimate of 46 economists in a Bloomberg survey that called for a 0.5 percent gain, Commerce Department figures showed today inWashington. The October reading was revised down to show a 0.2 percent drop from a previously projected 0.8 percent increase, showing the initial data are susceptible to swings in direction. Recent gains in the housing market, spurred in part by mortgage ratesnear record lows, are helping the construction industry recover from the 18-month recession that ended in June 2009. Public expenditures also climbed during the month, a sign that budget constraints may be easing. Estimates in the Bloomberg survey ranged from a drop of 0.6 percent to an increase of 1.4 percent. Private construction spending climbed 1 percent in November from the prior month to $522 billion, the highest level since December 2009. Homebuilding outlays increased 2 percent, including a 2.6 percent gain in home improvement. Expenditures on single-family and multifamily housing also improved. Spending on public construction climbed 1.7 percent, today’s report said. Federal construction outlays increased 5.3 percent, the biggest gain since August, to $27.6 billion. Outlays by state and local agencies rose to the highest level since January 2011. In November, builders broke ground on more homes than at any time in the previous 19 months and construction permits climbed to a one-year high, suggesting housing may not be a drag on gross domestic product next year, data from the Commerce Department showed last month. Housing starts were at a 685,000 annual rate that month, Commerce Department figures showed Dec. 20. Building permits, a proxy for future construction, increased 5.7 percent. Homebuilder sentiment has improved as well. The National Association of Home Builders/Wells Fargo sentiment index rose in December for a third consecutive month, to the highest level since May 2010. Readings less than 50 mean more respondents said conditions were poor. Some companies say improvements are needed in commercial real estate.